There has been a church on Ludgate Hill dedicated to St. Paul, London's patron saint, since 604. The Normans began building another cathedral on this site in 1087. By the 17th century it was in a state of decay and in 1634 Inigo Jones was employed to restore it to its former glory. On 2nd September, 1666, the Great Fire of London destroyed a large area of the city including St. Paul's Cathedral. Sir Christopher Wren was given the task of designing and rebuilding St. Paul's - a task that was to take him thirty-five years to complete. The most dramatic aspect of St. Paul's was its great dome. It was the second largest dome ever built (the largest was St. Peter's Basilica in Rome). Both domes were based on the one in the Pantheon built by the ancient Romans. When Christopher Wren died in 1723 he became the first person to be buried in St. Paul's Cathedral. 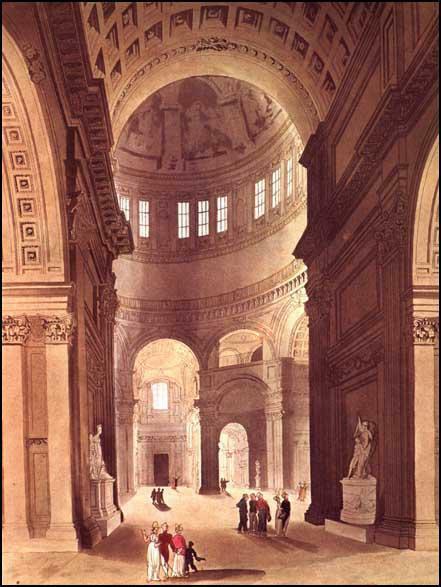 (1) Celia Fiennes described St. Paul's Cathedral in her journal in 1702. The great cathedral of St. Paul's was burnt by fire. It has since been rebuilt by a tax on coal. It is now almost finished and is very magnificent. The body of the church is not quite done. The church is going to be closed on the top with a large dome. (2) Daniel Defoe described St. Paul's Cathedral in a letter that he wrote in 1723. The cathedral of St. Paul's is exceedingly beautiful. The church of St. Peter's in Rome, which is believed to be the most magnificent in the world, only exceeds St. Paul's in the magnificence of its inside work; the painting, the altars, and the oratories, things, which, in a Protestant church are not allowed. The entrance to the west end is by three doors, with bassorelivos over them: the one in the centre, which is much larger than the others, is cased with white marble; and the sculpture over it represents St. Paul preaching to the Bereans. At the entrance the vista has a very impressive effect.